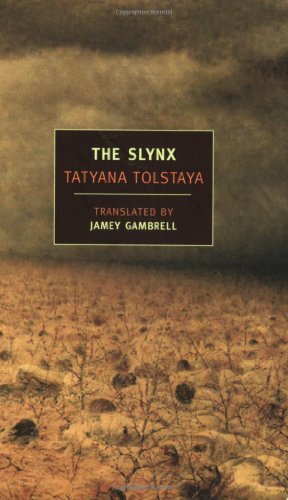 Tatyana Tolstoya’s The Slynx imagines a post-apocalyptic Russia, destroyed in a nuclear holocaust (“the Blast”) which has reduced to the world to an ignorant and technologically degenerate dystopia. There are those, the Oldeners, who were alive before the Blast who appear to be immortal. They are alive and unchanged from an event which happened 200 years prior to the setting of the novel. Those who were born after the event suffer “Consequences” (mutations) and are often mocked by their elders for their lack of civilisation and decorum. Although much of what the Oldeners remember is garbled (this provides some of the satirical humour in the novel). Seen through the eyes of Benedikt, a transcriber of old books, the novel examines the past of Russia, including its art, politics, culture and history. As a child of the Blast, Benedikt is mostly ignorant of the past, though his work does tend to bring him into contact with dangerous ideas. Limited ownership of pre-Blast books means that the leader, Fyodor Kuzmich, Glorybe, is able to pass off great works of literature as his own and to claim responsibility for the creation of the few technological devices that the society possesses. This provides some narrative thrust to the novel – Benedikt, though ignorant, doesn’t wish to remain so and is keen to read as much as he can. The Slynx draws on Russia’s literary tradition including Pushkin, Lermontov and Pasternak. Unfortunately, for me, these are areas of Russian literature with which I am unfamiliar. I have read some prose fiction written during Soviet times (mostly the obvious stuff; Bulgakov, Solzhenitsyn and their ilk) but my wider knowledge of Russian literature is a little more limited. As it happens, though, I had read Puskin’s Tales of Belkin which, whilst interesting, didn’t do a great deal for me. I’m given to understand that he is a more satisfying if you read his poetry in the original Russian. My inability to understand Russian makes this, sadly, impossible. So my first hand impressions of Pushkin are, sadly, not good. However, the poetry directly quoted is (handily) referenced at the back of the New York Review of Books edition and, despite my not being steeped in the Russian literary tradition sufficiently to always identify the allusions to both Russian literature and folk tales, still serves to create an air of Russian-ness around the novel (well… as far as I can tell). My point being that you don’t necessarily have to fear a novel like this because it is out-with your cultural experience. Some of the dialogue is similar to, say, Burgess in A Clockwork Orange or (though not nearly as extreme) Russell Hoban in Riddley Walker. Furthermore, it’s worth remembering earlier examples of this type of Russian literature fed into the Anglophone literary canon via George Orwell: Yevgeny Zamyatin’s We is an influence on 1984, for example. The translation is successful as far as portraying the society that Tolstaya intended, and also for keeping the writing interesting. However – and this is probably more a problem for me as a reader than it is a reflection on Tolstaya as a writer, or the translator – I spent a lot of time worrying about how some of the translations came about. For example, philosophy is rendered as “feelosophy.” While one can derive (base) humour from that, I wonder how it worked in the original Russian. My knowledge of Russian history is a little better. It is not surprising, therefore, that the wider historical themes of the novel were more satisfying for me than some of the meta-textual aspects of the novel (not that I didn’t appreciate them, unfortunately nothing exists in a vacuum; my own deficiencies do somewhat spoil my enjoyment of the literary references). Tolstaya started writing the novel in 1986, completing it in 2000. It is written against the backdrop of the liberalisation (relatively speaking, of course) of the Soviet Union under Gorbachev and it’s subsequent fall, through the immediate post-Soviet years. Tolstaya’s themes of freedom of thought and action can be extended to apply forwards and backwards through the history of Russia. It’s worth remembering that, while the Russian Empire was becoming more liberal immediately pre-October Revolution you weren’t seeing the replacement of a mature, open liberal democracy with tyranny and, similarly, you’d be hard pressed to successfully argue that Russian political elites have truly abandoned authoritarianism. Weighty themes and the invoking of Russian literary greats don’t mean that the novel is a dour one (well, it is a satire). It has a certain playfulness and bleak humour which makes the experience a more rounded one (something which I have noticed in my – admittedly limited – experience of Russian literature) than if it had taken itself too seriously. Some of the humour – as noted previously – is derived from the use of language, but there are plenty of other misunderstandings on the part of Benedikt and his compatriots which raise a wry grin. Benedikt, upon finding many, many, old books mistakenly believes that the pristine (as we know them to be) lesser works of pre-Blast literature are superior to those (such as Chekov) who have obviously been well-read. The rulers in The Slynx, therefore, abhor “freethinking.” Furthermore, people are discouraged from reading books from before the Blast. In the novel, aversion to dangerous ideas is hard-wired into people. Many of the books immediately post-Blast were irradiated and physically dangerous. By the time the events of the novel are taking place, 200 years have passed and this is no-longer the case, but people continue to self-censor through fear of physical consequences. I have to admit that I found this a slightly heavy-handed way of making the point, but that’s more due to personal preference than anything else. The least interesting thing about The Slynx is probably the story. It does have a resolution, of sorts, but I don’t believe that it particularly required one. The denouement of the novel introduces ideas about revolutions and the way that people can quickly become compromised during them, which are of interest; particularly considering the history of Russia. Equally, though, I think that Tolstaya was most interesting – and successful – in the earlier parts of the novel which saw a bleak and oppressive existence with not a great deal happening. Boredom , grinding poverty and a dangerous existence are well-described in a narrative which isn’t propelled from point A to point B. I think that’s the point; there’s no end in sight, nor any hope for the future. The Slynx is, problems with the plotting of the novel aside, a good addition to Russian satirical literature. As a paean to freedom and art it has a certain bleak and twisted beauty which makes it a, mostly, rewarding read. Any other problems I’ve noted are really more to do with me as a reader and shouldn’t be taken as being absolute. It’s not, perhaps, up there with Mikhail Bulgakov’s The Master And Margarita, but then, little is. This entry was posted in Review and tagged novel, russia, sf, Tatyana Tolstaya. Bookmark the permalink.